Fuseworks premium grade, high quality laser water-slide decal paper allows you to transfer your artwork to a glass surface for fusing. Using our exclusive water slide paper products, you can now customize, decorate, and enhance the appearance of your glass projects! All it takes is a computer, a printer with iron oxide toner and your creative skills to design and print your very own fusible decals. Decal paper is easy to use and is designed for use in the Fuseworks Microwave Kiln with beautiful sepia tone results. 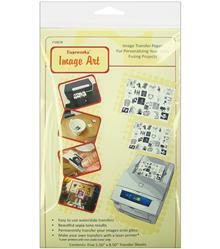 Each package contains five 8.50” x 5.50 sheets and complete fusing instructions and tips for use. Decal backing-paper 2-3/8" x 7"
Decals size range from 1/2" – 1"
Decal backing-paper: 2-3/8" x 7"